Sirv can create magnificent 360-degree spins out of your product images. To generate a spin, simply sign in to your Sirv account and upload a set of images. Sirv will automatically create an interactive spin to embed in your website. eBay does not allow truly interactive 360 spins but there’s a workaround. You can easily do it in Sirv’s UI. After creating your eBay listing, you can also share the 360 spin on Facebook. It’ll look just as good. Upload your images to Sirv. If you don’t have a Sirv account – sign up here. It’s free to try and takes a minute. The below code will work with images hosted elsewhere, but you’ll lose the ability to resize and optimize your product images. Switch to HTML mode in the description editor. 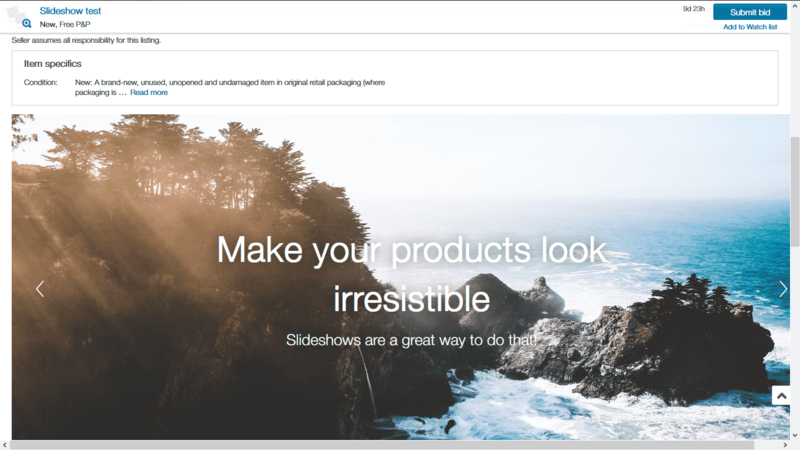 Add the slideshow stylesheet to your description. The remaining steps should also be done in HTML mode. Add additional styling to your slideshow. If you have absolutely zero knowledge of CSS, don’t worry. Copy the below code and it’ll just work. /*This is the slideshow container. Big thanks to Alex Erlandsson for creating the slideshow used in this article. Boost your sales with an image gallery that allows shoppers to browse all the product images you have. Shoppers love studying product images, so add a 360 spin to your gallery for the ultimate “Wow” effect. Upload your product images to Sirv. You’ll have instant control over the scale and cropping, plus it’ll serve images to your potential customers at lightning fast speeds. Read more about Sirv’s dynamic imaging options. You can even add spins here! Gallery images are below. Please change them to your own. Notice how Sirv allows you to resize images with "h" (height). With Sirv, you can easily crop your images and generate preview thumbnails. If you’re dealing with product images on a daily basis, this feature can save hours of your valuable time. Let Sirv handle your eBay image hosting, while you focus on growing your business. Start your 30-day free trial today.